Humans have a consuming desire for social interaction. Consequently, if a member is ostracised from a group, this can have huge implications for their well-being. Once ostracised, individuals may try to fortify their social needs by seeking out accepting groups. Research suggests that this makes individuals prone to social influence and joining negative groups. This paper evaluates current ostracism research, and discusses its implications with regard to identity and the radicalisation process. The aim was to highlight the risk factors that arose from the societal exclusion of Muslims through Islamophobia following 9/11, and the increase in homegrown terrorism with regards to ostracism research. It concludes that future research and counter-terrorism strategies must consider ostracism as a factor in the radicalisation process. On the 7th of July 2005, London was the subject of a violent attack on its transport system during targeted, peak traffic times. This form of violence is termed terrorism. Terrorism is difficult to define due to the varying nature of the acts, but can be regarded as the use of fear, intimidation and/or violence against non-combatants, with the objective to promote social or political aims (Kruglanski & Fishman, 2009). The prospect of future terror attacks is of concern to both the public, and to the nation’s government. However, the London terror attacks differed from prominent others during the 21st century, as investigations revealed that the London Bombings were not orchestrated by Al-Qaeda or foreign nationals, but were organised by three British citizens (Intelligence and Security Committee [ISC], 2009). This attack highlighted a new trend of ‘homegrown terrorism’. The London Bombings are a clear example of ‘homegrown’ terrorism, which can be defined as a terrorist act that is coordinated and executed from within the target country (Thachuk, Bowman, & Richardson, 2008). Homegrown terrorism can also be applied to western citizens, however, who are radicalised by foreign fundamentalist groups (e.g. Al-Qaeda) and then go on to commit terrorist acts. The London Bombings are not a unique example, but rather one attack in an increasing trend of homegrown terrorism (e.g. the Madrid Bombings, in which several bombs planted on commuter trains by Spanish residents were detonated at peak travel times; Thachuk, et al., 2008). This trend has been highlighted by the visible increase in homegrown terrorism within western nations, particularly in the United Kingdom. The British Security Service (MI5) have indicated increasing concerns towards British residents who pose a risk for coordinating and conducting attacks on UK soil (Jordan, 2006; Lyall, 2007, as cited in Thachuk, et al., 2008). The recent change from considering terrorism as an external threat, to a ‘threat from within’, is a critical one, and current psychological theory may be insufficient to explain why an in-group would act to attack their own. Thus, it is essential to begin to understand why such a change is occurring. An analysis of attempted, and executed, homegrown attacks in Europe and the US has revealed that Islamic extremism is of primary concern (ISC, 2009). Consequently, it is necessary to assess which factors could have triggered the trend for the dramatic increase in homegrown Islamic terrorism. The phenomenon of homegrown terrorism was not viewed as a concern by British intelligence in early 2002, wherein they stated that attacks were more likely to be conducted by terrorists entering from abroad. However, in early 2004 this view had changed dramatically, and reports were published stating that homegrown terrorism was likely to be a problem within the next five years, and that several potential threats were posed by British citizens (ISC, 2009). In examining the timing of these statements, research would suggest that there may be a link between the attacks on the American Twin Towers in 2001 (referred to as ‘9/11’) and the increase in threat (both perceived, and real) posed by homegrown terrorism. Statistics have indicated that 80% of known homegrown terrorists (i.e. 211 individuals who were either killed in the completion of jihadist activites, identify with an extremist organisation or were indicted for other violent crimes) began their radicalisation to extremist ideologies or acts after the events of 9/11 in the United States. Similar trends have also been noted in Europe, with the terrorist threat there changing from a predominantly external to an internal concern in early 2002 (Study of Terrorism and Responses to Terrorism [START], 2011; Precht, 2007). This was not a short-lived response to 9/11, but an increasing trend in the years that have followed. A 75% increase in homegrown ‘plots’ between 2006 and 2007 was reported in the UK for example (Jordan, 2006; Lyall, 2007, as cited in Thachuk et al., 2008). The prominent nature of the 9/11 attacks has had worldwide consequences, influencing the invasion of Afghanistan and the American ‘War on Terror’ (Thachuk et al., 2008). The cost of these attacks in the West has not only included the lives of the victims lost, but has also had continued negative consequences for western Muslims as a result of stigmatisation (Githens-Mazer & Lambert, 2010). This stigmatisation has led to a dramatic increase in Islamophobia (Poynting & Mason, 2007). This is a contemporary manifestation of racism and is a term used to describe the fear and/or hatred that individuals or groups have of Muslims (Kunst, Tajamal, Sam, & Ulleberg, 2012). In a review of Islamophobia, a number of recent case studies highlighted the relatively unacknowledged increase in violent crime towards, and the intimidation of, Muslims post 9/11 (Githens-Mazer & Lambert, 2010). This report clearly indicated through a series of interviews the fear, isolation and discrimination that a number of Muslim citizens in the UK have experienced in recent years. In the United States, a Federal Bureau of Investigations (FBI) investigation reported that in 2001 there was a 1,600% increase in Muslim hate crime. Although this figure has since been significantly reduced, it has yet to return to pre 9/11 levels (Civil Rights Summit [CRS], 2011). Thus, these statistics clearly show the impact of 9/11 with regards to stigmatisation and Islamophobia for western Muslims. The UK is a highly ethnically diverse country, with high levels of multiculturalism, which are steadily growing. This increase in ethnic and religious diversity has resulted in some British citizens proclaiming their unease with regard to losing their ‘Britishness’ however. A study revealed that while individuals fear losing their ‘Britishness’, this was not actually based on a fear of increasing ethnic diversity, but rather it was predominantly blamed on the expansion of the Muslim community (Commission of Racial Equality [CRE], 2005). This research revealed that the majority of non-Muslim participants believed that individuals could not be both Muslim and British, and that many of them feared that the streets would be “taken over by extremist Muslims” (CRE, 2005, p.10). Furthermore, the Muslim participants indicated that they also felt they had to choose to either be Muslim or British, even though they identified as both. Finally, an increasing level of frustration was reported by both the Muslim and Non-Muslim (predominantly white British) participants with regard to each other, however, they still felt that other racial issues in the UK were declining (CRE, 2005). The study above clearly indicates the increasing tension between Non-Muslim British citizens and Muslims. Within the academic literature, researchers have suggested that 9/11 resulted in a breakdown in multiculturalism and as a result, people are resisting or proactively preventing the integration of Muslims into communities. Thus, this has lead Muslims to assimilate western, mainstream values and take on the national identity of being British or risk being ostracised by society and the target of racial hostility (Abbas, 2005). An article regarding the personal impact of 9/11 stated that a Muslim individual questioned his “own notions of identity and belonging” following the hostility he received in a post-9/11 world (Saeed, 2007, p. 210). It is proposed that such treatment may result in individuals believing they must either reject their Muslim faith, or risk being rejected by mainstream society (Saeed, 2007). This literature review aimed to investigate how these feelings of isolation and ostracism could result in an increased likelihood to join extremist terrorist groups. It examined the research regarding the theories of ostracism and then investigated how these factors could play a role in personal identity and the radicalisation process. Ostracism is defined as the act in which an individual or group is ignored and excluded by another individual or group. That is, it can refer to a single person being excluded or a group of people being excluded, with a single person or a group excluding them (Williams, 2007). Ostracism research is currently a rapidly expanding area, but has traditionally been relatively overlooked. However, a sharp increase in recent atrocities, such as school shootings, and politically driven attacks (e.g. the attacks in Norway, wherein an extremist detonated a bomb outside a government building and then proceeded to shoot and kill 69 individuals at a political summer camp, Eriksen, 2012; Borchgrevink, 2013), has lead people to consider the role that social isolation may play in triggering the planning of complex and violent acts (Twenge, 2000). Ostracism results from social exclusion and rejection, and thus it is appropriate to define this. Social exclusion is the process in which an individual or group is kept apart from other individuals or groups, whereas rejection refers to the explicit statement that someone is unwelcome (Williams, 2007). Research has indicated that ostracism can actually be functional and adaptive with regards to promoting the survival of the excluding group (Barner-Barry, 1986). However, for animals, and early humans, exclusion from a group was likely to result in starvation or death from a lack of group protection (Williams & Zadro, 2005). Thus, it would be reasonable to deduce that strong reactions to being ostracised could be an adaptive mechanism. If an individual’s survival depended on their being part of a group, it is logical that the distress individuals experience as a result of social exclusion and rejection may also be a product of evolution. This has led to a vast amount of research considering the evolution of an ‘ostracism detection system’ which provides an alarm system for humans in the presence of perceived ostracism, allowing them to change their behaviour and try to maintain social inclusion (see Williams, 2007, for review). How Does Ostracism Affect an Individual’s Well Being? A review conducted by Williams and Zadro (2005) looked at the effect of ostracism on self-esteem, a variety of emotions and feelings of belonging. This review study indicated that after a manipulation of ostracism, or following the prompted recollection of a time where they had been ostracised, participants reported strong feelings of anger, frustration, sadness, and lower self-esteem, feelings of control and feelings of a meaningful existence. Furthermore, this result was found even when it was deemed costly to be part of a group and not ostracised. Van Beest and Williams (2006) conducted a study wherein they used a Cyberball paradigm (an online ball game developed by Williams, Cheung, & Choi, 2000) to manipulate exclusion and ostracism, and made it financially costly to be included. They found that participants who were included in the game were happier than if they were excluded, regardless of whether they lost or gained money. The aforementioned research indicates that being part of a group elicits more happiness and satisfaction than receiving financial gains. In addition to this, it has been demonstrated that even if the ostracising group is a despised group (e.g. the Ku Klux Klan) or the ball is actually a bomb that will explode at some point and kill a player, individuals are still distressed if they are excluded (Gonsalkorale & Williams, 2006; van Beest & Williams, 2006). This indicates that regardless of ‘who’ is ostracising or the ‘benefits’ of being ostracised, individuals will still feel distress when left out. Research has also provided evidence of psychological and physiological responses to ostracism. Stroud, Tanofsky-Kraff, Wilfley, and Salovey (2000) noted that an episode of ostracism resulted in a stress response with increased blood pressure and cortisol levels. In addition, ostracism has been linked with a variety of physical health issues (Cacioppo & Hawkley, 2003), such as increased chance of a heart attack (Case, Moss, Case, McDermott, & Eberly, 1992) and mortality (Cacioppo, Hawkley & Berntson, 2003). Furthermore, research has indicated that ostracism can result in activation of the brain region associated with physical pain, the dorsal anterior cingulate cortex (Eisenberger, Lieberman, & Williams, 2003). The area associated with pain regulation has also shown greater activity in those who can cope with ostracism to the greatest extent (Eisenberger et al., 2003; Wiech et al., 2008). Finally, Wiech et al. (2008) found that there was increased activity in the brain regions associated with pain regulation when individuals engaged with religious stimuli who then, in turn, reported less pain. Thus, pain could be a factor in ‘driving’ individuals to religion or extreme ideologies after ostracism, as it would allow them to regulate social pain to a greater extent. This has been supported by behavioural evidence that has demonstrated an increase in the desire for religious activity following ostracism (Aydin, Fischer, & Frey, 2010). It appears that humans have an instinctive desire to socially interact and belong to a group (Leary, 1999). It has been suggested that when ostracism occurs, there is a threat to four needs: a need to belong, a need for self-esteem, a need for control and a need for meaningfulness (Williams, 2007). One of the main factors considered to be a motivation to become a member of a group is the need to belong. Baumeister and Leary (1995) provided support for this need, and stated that the need to belong is the fundamental motivation for social interactions. Furthermore, they discussed the impact of a lack of belonging on health and well-being. Baumeister and Leary (1995) concluded that the intense, extreme feelings that can result from ostracism are a warning to notify individuals that there is a threat to their need for belonging. Evidence suggests that once an individual has been rejected or ostracised, the more attuned they become to behaviours that predict rejection or perceptions of ambiguous behaviour as a rejection (Ayduk et al., 2000). In addition, research has demonstrated that individuals who experience ostracism more readily notice and respond to opportunities of social inclusion in an effort to fortify their sense of belonging (Pickett & Garderner, 2005). The second factor is a need for self-esteem. Leary (1999) argued that a need to regulate self-esteem motivates individuals to ensure they are acting in a way to promote good interpersonal relations, and developed the sociometer theory. This states that self-esteem provides a gauge to monitor how acceptable and sociable behaviours are. Thus, when there is a reduction in an individual’s self-esteem (e.g. the individual is ignored), they register that their social inclusion and interpersonal relations are not at an optimum level, and therefore alter their behaviour to ensure social inclusion. This is supported by empirical studies where ostracism is manipulated and in almost all cases a drop in self-esteem is reported (Williams & Zadro, 2005). The third need or social motive is the need for control. It has been suggested that when individuals are ostracised from their group, they feel a lack of control and helplessness. If conflict occurred between two parties rather than ostracism, an involved individual could still react in some form (e.g., act violently or change the conversation topic). However, when ostracism occurs, this results in the individual feeling they are completely helpless in resolving or reacting to the situation (Williams & Zadro, 2005). Consequently, studies that have examined ostracism have found that following exclusion there is typically a reduction in self-reported feelings of control (Smith & Williams, 2004). However, it should be noted here that the aspects of control in ostracism are the least studied need-threat, and further research in this area should be conducted (Williams & Zadro, 2005). The final aspect to be considered is the threat to the need for a meaningful existence. The threat to this need is closely related to the threat of death, and thus is based on Terror Management Theory (TMT; Williams & Zadro, 2005). It has been suggested that when one is excluded from a group, it is a mortality salience cue. This may be because it provides an insight into how the world would be (with regards to the group) if the individual were non-existent. As with the aforementioned threats, when ostracism is manipulated self-reports have revealed that participants experience feelings that their meaningful existence has been diminished (Williams, 2007). These factors are suggested to play a key role in rendering an individual vulnerable to radicalisation. As stated, a need to belong and self-esteem are motivations that are suggested to give individuals feedback on their social inclusion and alter their behaviour accordingly. However, if individuals are excluded due to stigmatisation, this is a behaviour that an individual cannot regulate, and in turn, this may affect their need for control and meaningfulness. If an individual feels that the ostracism is occurring regardless of their behaviour, they may feel unable to control this, and in addition, if their attempts to reintegrate are ignored they may feel meaningless. Thus, it is suggested that societal ostracism may largely influence an individual’s tendency towards radicalisation. The extent to which each of these needs is threatened as a result of ostracism is proposed to mediate the extent to which an individual acts in a pro-social and ingratiatory, or aggressive and hostile, manner. Specifically, it is suggested that if ones need to belong or self-esteem are threatened it is likely to result in pro-social actions, for example, acting ingratiatory to gain re-acceptance. If ones need for control or meaningfulness is threatened however, it is likely to result in more aggressive and hostile actions (Williams, 2007). This is where extremist groups may provide an opportunity to fortify all four threatened needs, presenting victims of ostracism an opportunity to gain belonging and in turn self-esteem, but also the chance to regain control and meaningfulness through political violence. The research presented above demonstrates that people report reduced feelings of belonging, control, self-esteem and meaningfulness following ostracism (Williams & Zadro, 2005). However, research has demonstrated that some individuals experience and report a very minimal impact on their mood (Twenge, Baumeister, Tice, & Stucke, 2001). Intuitively, it could be suggested that following an episode of ostracism, an individual is likely to present a reduced positive mood, with an increase in feelings of sadness and negativity. Thus, it is necessary to explore what factors could account for an apparent lack of emotion after ostracism. It has been suggested that the lack of emotion or ‘numbing’ that is present in many individuals following ostracism, may be as a result of a deconstructed cognition. Social exclusion may result in emotional numbing as a means of protecting the self against the pain of ‘social injury’ by preventing negative feelings from entering awareness (Massong, Dickson, Ritzler, & Layne, 1982). Research has revealed that as a result of social exclusion there can be a reduction in experienced emotion, meaningful thought and self-awareness and that these factors are characterised by lethargy and a lack of time perception (Twenge, Catanese, & Baumeister, 2003). This cognitive deconstruction effects an individual’s cognitive processing as a whole, and has been shown to impact negatively upon a variety of cognitive functions. Of particular importance, it has been demonstrated to reduce executive functioning (Baumeister & Dewall, 2005). This may have profound effects on information processing and, as a consequence, may render individuals more receptive to social influence and the suggestion of previously illogical actions, and thus to radicalisation (Wood, 2000). The vast majority of research into ostracism has investigated it on a relatively small scale, focusing primarily on individuals ostracised from a specific group and at best, investigating small-scale groups that have ostracised others. However, as research in the area of ostracism increases, there is evidence to suggest that ostracism should be considered from a larger scale, such as a societal level (Williams, 2007). It has been suggested that Islamophobia and the subsequent avoidance and exclusion of Muslims from western societies, is comparable to ostracism. Throughout this review it has been noted that many Muslims feel that society will not allow them to identify as both a western citizen (e.g. British) and a Muslim. Thus, this next section will consider how being forced to relinquish an identity is comparable to ostracism. To consider the impact of ostracism of an individual from a group, it is important to understand the relationship between an individual and their group. Tajfel and Turner (1979, as cited in Hogg & Vaughan, 2008) proposed the concept that an individual has both a personal identity and a social identity. A social identity has been defined as the self-image that results from being a member of a group (Levin & Sidanius, 1999). Thus, a group will provide individuals with a collective self-conception, and when members are ostracised they lose both this and their sense of social identity. This loss, and threat to an individual’s self-conception, has been linked to similar health problems (e.g. physical illness) and psychological impacts (e.g. reduced self-esteem) in studies investigating ostracism (Salovey, Rothman, & Rodin, 1998; Tennen & Affleck, 1993). The social identity theory promotes the concept that individuals can have multiple identities. In considering a western Muslim, this means they can identify as a Muslim and a citizen of the country they reside in (e.g. British). It may be beneficial to have multiple identities so that if one is threatened, individuals can depend and rely on another (Linville, 1987). Consequently, it is suggested that after the events of 9/11, the increase in Islamophobia and subsequent ostracism, individuals who once identified, for example as a British-Muslim, relied more heavily on their Muslim identity. This suggestion is supported by empirical data and qualitative personal accounts, which have revealed that following the tragedy of 9/11, Muslim communities in the West showed an increased reliance on their ethnic identities (Gould & Klor, 2012; Githens-Mazer & Lambert, 2010; Saeed, 2007). At this point it should be noted that although there has been a substantial increase in Islamic homegrown terrorism, the vast majority of British-Muslims are not extremists, and reside peacefully within society. Thus, it is not suggested that ostracism is the cause of homegrown terrorism but rather constitutes a risk factor. Identity fusion refers to a situation wherein the personal self-concept is merged with the social self-concept. To clarify, social identity theory suggests that individuals can have both a personal and social self and that these two ‘selves’ are related and co-existing. In cases of ‘high’ identity fusion, the personal self is dependent on the social self (i.e. they do not co-exist). Thus, individuals who are highly fused to their social identity feel that they have familial ties to all group members, that everyone is working for the benefit of the group and that extreme action is justified in the presence of any threat to the group (Gómez, Morales, Hart, Vazquez, & Swann, 2011). Swann, Gómez, Seyle, Morales and Huici (2009) showed that high identity fusion resulted in an increased willingness to fight and die for one’s group for example. Gómez et al. (2011) looked at the relationship between identity fusion and ostracism. They found that individuals who are highly fused to their social identity are likely to use extreme compensatory actions to benefit their group and retain membership. In contrast, if an individual has a lower identity fusion, they are more likely to withdraw from the group and distance themselves (even acting in a harmful way) from the source of ostracism (Gómez et al., 2011; Zadro, 2011). In line with this research, it has been suggested that western Muslims do not feel highly fused with their identity relating to the nation they are residing in (e.g. the UK), particularly following the events of 9/11 (Gould & Klor, 2012; Lambert & Githens-Mazer, 2010; Saeed, 2007). Thus, if they are ostracised, they may begin to distance themselves further from their national identity and identify more with their religious identity. This may be because their identity-related group is more accepting of them, but is also what excluders appear to judge them on, making their religious identity (group identity) appear more salient than their personal qualities, and thus, personal identity. Consequently, the prolonged experience of Islamophobia may lead to increased identity fusion with their religious groups, and an increased chance of anti-social actions against their excluders (Gómez et al., 2011). The evidence provided throughout this review thus far has shown that ostracism can provide individuals with strong motives to fortify any of their needs that may have been threatened (e.g. belonging, self-esteem, control and meaningfulness) during and following social exclusion. This can also leave them with reduced cognitive regulation and a sense of a loss of identity, resulting in individuals who may be more vulnerable and receptive to social influence (Wood, 2000; Williams, 2007). These factors can make them desirable targets for radicalisation, and this section explains how the consequences of ostracism can cause this. This theoretical framework is illustrated in Figure 1. An Illustration of the Theoretical Framework of the Processes Influencing Ostracism and Homegrown Terrorism. Radicalisation is the process in which an individual adopts extreme ideologies and beliefs, which may or may not result in extreme behaviour (McCauley & Moskalenko, 2008). It is important to note that radicalisation is often considered to only have occurred in individuals who exhibit extreme actions. However, it can also involve those who have been implicitly radicalised (e.g. they now hold radical beliefs) but yet show no explicit evidence of radicalisation. Nevertheless, radicalisation that results in an action or behavioural change is of greatest concern (McCauley & Moskalenko, 2008). McCauley and Moskalenko (2008) reviewed the process and mechanisms involved in radicalisation. They noted the pyramid structure of beliefs, wherein there are many individuals at the bottom who sympathise with the concern, however only relatively few at the top hold extreme beliefs and are likely to act upon them. This concept can be demonstrated with Islamic extremists for example. The extremists are the relative few at the top of the pyramid, while at the bottom there are many who sympathise with their cause, but do not feel action is required. Individual radicalisation. The first stage of radicalisation is individual radicalisation as a result of personal victimisation. This is clearly a salient point for individuals who have been ostracised due to their religious affiliation. Throughout this review, the feelings of fear and isolation experienced by western Muslims have been clearly demonstrated by the inclusion of case studies and statistics indicating increases in hate crimes and social exclusion post 9/11 (CRS, 2011). As a result of such victimisation, individuals may enter the path of personal radicalisation as a result of a desire for revenge (McCauley & Moskalenko, 2008). The second stage is very similar, as it states individual radicalisation results from political grievances and action taken in response to a perceived negative political trend. Both of these stages are clearly factors that might stem from ostracism. If British-Muslims in a post-9/11 world are considered, the subsequent exclusion they felt may have incited a wish for revenge upon their excluders, and a desire to retaliate to political backlash with regards to Islam. Zadro (2011) revealed that when an individual is ostracised they often want revenge or ‘payback’ from the individual(s) of the source of ostracism. Thus, it can be concluded that ostracism may lead to individual radicalisation as a result of victimisation and/or political grievance. Joining radicalised groups- ‘the slippery slope’. Once the individual has experienced personal radicalisation, they may consider joining a radicalised group. The likelihood of this process occurring may be increased when ostracism has been involved. In the research presented on ostracism, it was stated that individuals have a need to belong and a desire to be part of a group. Thus, when ostracised from their group they may seek to rejoin the group that ostracised them. However, they can often instead withdraw from that organisation and then try to harm the ostracising party (Gómez et al., 2011; Zadro, 2011). Yet, the need to belong still exists, and therefore individuals may also seek out groups that support the reason they were ostracised. It was noted, for example, that as a result of Islamophobia, one individual stated that he resorted to relying mainly on his Muslim friends and family (Saeed, 2007). It has been suggested that the process of joining a terrorist group is that of a ‘slippery slope’ and therefore may begin as just a show of interest, but over time, can lead to their being involved in much more serious group actions (McCauley & Moskalenko, 2008). The research also indicates that this process may be accelerated in individuals who have recently been ostracised, as they are more receptive to signs of social acceptance (Pickett & Gardener, 2005) and will be more willing to join a group, even if extreme (Williams, 2007). This is the first step of the group socialising process and refers to the investigation stage, whereby the individual tries to find a group that matches their needs (Moreland, Levine, & Cini, 1993). In the case of Islamic homegrown terrorism, this may involve finding a group that represents their Islamic faith, and, if they have been subjected to ostracism, who also has a negative view of the ostracising group. The next stage is the socialisation stage, wherein the new member adopts the norms and attitudes of the group. Here, as a result of ostracism, the need for belonging and cognitive deconstruction may cause the individual to become very receptive to social influence. As discussed previously in this review, one of the primary impacts of ostracism is reduced information processing abilities due to cognitive deconstruction (Twenge et al., 2003). This can cause individuals to become illogical and thus, render them more susceptible to social pressure (Ball, 2011; Wood 2000). Gonsalkorale and Williams (2006) demonstrated that the need to belong is a strong motivator for joining a group, regardless of whether if it is a negative group. Furthermore, it has been found that once individuals have been accepted into the group, they are much quicker to conform to group norms. A study by Williams, Cheung, and Choi (2000) found that individuals who were ostracised via the Cyberball paradigm were more likely to conform to a subsequent task based on the Asch paradigm. This requires a participant to judge unambiguous line lengths in a group scenario. However, the group is made up of confederates who clearly give the wrong answer, and thus the study assesses whether or not the participate conforms to give the incorrect answers of the group. Secondly, a study compared the effects of compliance techniques (e.g. ‘foot in the door’) with individuals who had been ostracised, and individuals who had not. They found that the individuals who had been ostracised were more susceptible to these compliance techniques (Carter-Sowell, Chen, & Williams, 2008). Group radicalisation in like-minded and isolated groups. When a variety of people join together to form a group, the average group opinion typically shifts towards the extreme opinions on whichever side the opinion is based (Myers & Lamm, 1976). This shift occurs to the side of which the majority of the group resided before the beginning of the discussion (McCauley & Moskalenko, 2008), a phenomenon called ‘group polarisation’. This can be particularly dangerous if a number of individuals who have been ostracised come together to form a group. Twenge et al. (2001) demonstrated that following ostracism, there is increased out-group hatred towards the group that conducted the initial exclusion. Furthermore, many report the desire to exact revenge on their ostracising perpetrators (Zadro, 2011). Thus, when individuals come together with social exclusion grievances, the decisions they make may escalate due to their desire for revenge combined with the phenomenon of group polarisation. For example, if individuals meet and discuss how they feel that society is excluding them for religious reasons, it may initially involve complaining, but then result in an escalated decision to take action (e.g. a terror attack). It must be noted that such a decision does not result out of mere compliance with other members either, but rather has been found to involve a personal internalisation of radical opinions (Brown, 1986, as cited in McCauley & Moskalenko, 2008). Finally, such escalations may be more likely in victims of ostracism, as they, more than any, wish to show devotion to their new group and ensure status and a place as a member (Collier & Horowitz, 1989, as cited in McCauley & Moskalenko, 2008). The next factor to consider is the isolation that groups excluded by society may feel. As discussed, individuals who are suffering from the effects of ostracism may come together to share extremist ideas. They often form as terrorist cells within a larger organisation (e.g. Al-Qaeda) and this form of isolation, combined with a fear of being caught, can lead to increased group cohesiveness (McCauley & Moskalenko, 2008). This can result in members feeling an increased pressure to conform to both the group attitudes and actions (McCauley & Moskalenko, 2008). Research evidence also shows that increased group cohesion can cause greater out-group discrimination, and that member perceptions of power and justification of violence towards an out-group increases (McCauley & Moskalenko, 2008; Petersen, Dietz, & Frey, 2004). Threats to control, meaningfulness and an increase in anti-social behaviour. 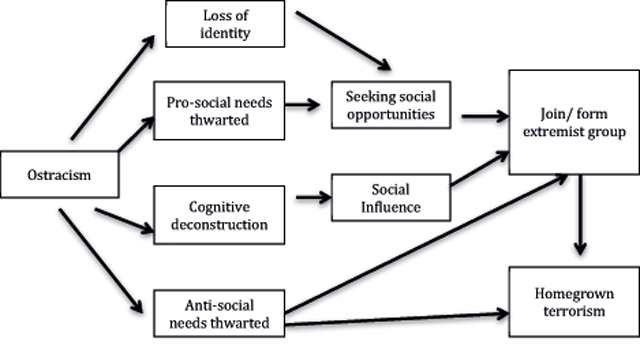 Threats to a need for meaningfulness and a need for control have been identified within this review as being of key importance when considering how anti-social behaviour arises in victims of ostracism (Williams, 2007). As stated, ostracism could result in feelings of impeding mortality and lack of meaningfulness, as it allows an individual to see the world as if they never existed. Terror management theory states that if a group is feeling threatened they will ‘stick to the familiar’ and as such, may react with hostility towards out-groups (Fiske & Taylor, 2008). This could be a key factor in the ostracism of western Muslims and the radicalisation of western citizens. If they feel that their identity as a Muslim is being threatened, and their need to assimilate with society is increased, they may begin to identify more with their Muslim in-group, increasing their hostility towards the ostracising out-group. This could potentially increase identity fusion, which, as stated, can also result in very extreme actions in conjunction with ostracism (Gómez et al., 2011). Further research is necessary to delineate the exact nature of these relationships however. A threat to control arises from ostracism because the individual feels helpless in controlling the exclusion that is occurring. This is a salient point when considering the sudden exclusion western Muslims felt after 9/11 (Githens-Mazer & Lambert, 2010; CRE, 2005). Ostracism is suggested to result from a lack of compliance to group norms or from an individual acting in a way that threatens the group (Barner-Barry, 1986). However, for Muslims suffering as a result of 9/11, it is due to something completely unrelated to them personally and/or their individual actions. Thus, the feelings of helplessness and lack of control are likely to be acute and frequent for these individuals. There is extensive research indicating the link between a perceived lack of control and aggression. For example, individuals who are not given the opportunity to regain control after ostracism, will allocate greater amounts of hot sauce to an individual known to not like hot food, compared to those who were given the opportunity to regain control (Warburton, Williams, & Cairns, 2006). It has also been suggested that a lack of control and meaningfulness are related (Williams, 2007) and could be a primary trigger in the joining of terrorist organisations. The completion of a terrorist act typically results in the publication of ones name in several worldwide media outlets, thus resulting in the ultimate control through fear and the fundamental need of a meaningful existence will be fulfilled. How do terrorist organisations target ostracised individuals? A report conducted by the Home Affairs Committee (HAC; an institution within the UK government) outlined three main platforms through which terrorists engage in the radicalisation of western citizens: at universities, at prisons and on the internet (HAC, 2012). Interestingly, for two of the three platforms (prison and university), the individuals are separated from the positive influences of family and friends, and in prisons they are also further ostracised and isolated from society. Research has indicated that the strongest factor in de-radicalising inmates who were radicalised during their stay in prison was the support of both their families and their community and points to the protective effect that this support can have (HAC, 2012). The report indicated that the internet was a significant concern and likely plays a major role in the radicalisation process; however, they do note that eventual ‘face-to face’ contact is an important factor. Research has indicated that individuals do not react as strongly to online ostracism as those who experience it in person (Williams et al., 2002). Thus it is possible that those fearing further ostracism may turn to the internet, in the hope of finding social inclusion. In addition, it has been suggested that the internet allows individuals to quickly change identity, which may reduce anxiety regarding future ostracism (McHarg, 2012). Thus, the internet is a place where many socially excluded individuals may potentially ‘gather’. Given the evidence regarding ostracism, and ostracised individuals having an increased willingness to seek out opportunities for social interaction (Pickett & Gardener, 2005), and susceptibility to social influence (Ball, 2011), recruiters for terrorist groups may successfully target such individuals online. Humans are a social species that desire to be part of a group, to the extent that an individual’s well-being depends on social interaction. The use of ostracism as a punishment “worse than death” clearly indicates the impact that social exclusion has (Barber, 2003, p. 69). The effects of ostracism and social exclusion have been discussed throughout this review, indicating the profound negative impacts they can have on people’s health. Short-term effects can result in an immediate and acute ‘social pain’, and long-term isolation has been linked with decreased physical health (Eisenberger et al., 2003; Stroud et al., 2000). Ostracism research has primarily focused on looking at the effects upon an individual being ostracised by a group or other individuals. However, there is now an increasing amount of research considering societal level and larger-scale ostracism (Williams, 2007). This review considered ostracism from this perspective, evaluating the impact that 9/11 had on the everyday lives of western Muslims, as a result of increased Islamophobia and subsequent social exclusion. Societal level ostracism is still very much under-researched, but this review would suggest that this may be more detrimental than smaller forms of ostracism. Thus, greater future research attention is clearly needed. The review has focused on how ostracism may be a triggering event in the trend for Islamic homegrown terrorism in the west. Research clearly suggests that after 9/11 there was a dramatic increase in the use and reported cases of homegrown terrorism (ISC, 2009; Precht, 2007; START, 2011). It has been proposed throughout this review that the documented exclusion of Muslims after 9/11, and the subsequent effects of ostracism, increased the likelihood of such individuals being radicalised. Research was presented that highlighted how the four basic social needs can be impaired following an episode of ostracism and how, in an effort to fortify these needs, individuals may be more susceptible to joining extremist groups (Williams & Zadro, 2005; Williams, 2007). This is based on the proposition that such extremist groups may present not only an opportunity for a sense of belonging, and in turn self-esteem, but also a way to regain control and a sense of meaningfulness through anti-social actions. In addition, ostracism was discussed with regards to the loss of identity. This review suggested that a loss of identity (e.g. ‘British-ness’) as a result of the events of 9/11, could have comparable effects to the group-level ostracism that is the focus and experimental manipulation of much of the ostracism research. Furthermore, it highlighted how exclusion and the loss of one identity, may lead to the possible risk of over-dependence and identify fusion to a religious or ethnic identity. This is an established factor believed to result in more extreme actions on behalf of that group/identity (Gómez et al., 2011; Gould & Klor, 2012). Finally, research was discussed that highlighted how ostracised individuals are more receptive to opportunities for social interaction, are more susceptible to social influence, are more conformist, and have a desire for revenge on their excluders. These are all primary factors which highlight an increased risk and tendency towards joining and/or acting on behalf of an extremist group (Pickett & Gardener, 2005; Williams et al., 2000; Wood, 2000; Zadro, 2011). Given the research presented in this paper, it could be suggested that a ‘perfect storm’ of factors arise as a result of ostracism that may influence the radicalisation of individuals and their participation in extremist activities. Thus, ostracism is clearly an important factor to consider in understanding homegrown terrorism. However, a key word to consider here is ‘risk factor’. This review does not state that ostracism causes homegrown terrorism; the non-fundamentalist Muslims that have been exposed to ostracism clearly outnumber those who have been radicalised for example. However, the research does suggest that ostracism increases the likelihood of joining and acting on behalf of terrorist organisations. The consideration of ostracism as a risk factor allows it be included in the formation of counter-terrorism strategies. This review suggests that following ostracism, individuals are likely to be more receptive to signals of social acceptance in the hope of restoring group membership and thus fortify their need to belong (Pickett & Gardener, 2005). The provision of support groups that can fulfill this need, and encourage pro-social goals may pose one such strategy. For example, it was discussed that universities are considered a high-risk area with regards to radicalisation. Consequently, it may be of benefit to provide groups to support fellow Muslims and encourage pro-social activities. Further support for this recommendation is provided by evidence that aggression and hostility to the ostracising group is reduced if the individual who was ostracised receives some form of friendly communication and connection following the exclusion (Twenge et al., 2001). Finally, another counter-terrorism strategy could involve providing highly multicultural communities with community goals. Research has indicated that super-ordinate goals, in which two or more conflicting groups must work together to complete, have the ability to reduce intergroup conflict (Sherif, Harvey, White, Hood, & Sherif, 1961). The research presented throughout this review appears to indicate that there has been a recent increase in homegrown terrorism, specifically Islamic extremism. This may not be the case however. The concept of homegrown terrorism has always existed (e.g. see material on ‘political activism’), however it has only gained widespread recognition in recent years in light of 9/11 and other similar tragic events, leading to the introduction of the novel term (Sageman, 2012). Thus, the change in the terminology used may account for the apparent increase in homegrown terrorism, rather than an actual increase in the coordination and/or completion of such attacks. Consequently, the proposed link between the 9/11 attacks, the societal exclusion of Muslims and the increase of homegrown terrorism may not be as strong as it appears. Another limitation to this research is the lack of evidence indicating exactly what mediates the extent to which each of the four needs are threatened by ostracism. There is research to indicate why some individuals may react more strongly to ostracism, for example, the personality disposition of rejection sensitivity (see Williams, 2007 for review). However, as of yet, no research accounts for which factors lead to pro-social (need for belonging and need for self-esteem) and anti-social needs (need for control and need for a meaningful existence) being threatened, and to what extent they are threatened. As this is a key concept in this theoretical framework, further explanation of this is necessary. The literature clearly suggests that ostracism may play a role in rendering individuals more susceptible to radicalisation and that this, in turn, can enable the potential development of novel counter-terrorism strategies. This review has highlighted a lack of research into the effects of societal level ostracism however, and a relative lack of research investigating the role of ostracism in prompting individuals to join extremist groups. This appears to be a promising area with regard to counter-terrorism strategies and thus it is suggested that research-based resources are provided sooner, rather than later, to mediate and prevent the recruitment and radicalisation of ostracised individuals. The use of extremist groups to try and fortify needs appears to be a vicious cycle, as once joined a member becomes further ostracised due to their negative nature and further stigmatisation occurs. It is essential that this cycle is broken. Ball, A. B. (2011). Examining the Effects of Ostracism on Neural and Behavioral Indices of Cognitive Self-Regulation. Retrieved on 22nd March 2013 from http://www.google.com/search?q=Examining+the+Effects+of+Ostracism+on+Neural+and++Behavioral+Indices+of+Cognitive+Self-Regulation+&hl=en&. Barber, B. R. (2003). Strong democracy: Participatory politics for a new age. Berkeley: University of California Press. Baumeister, R. F. and Dewall, C. N. (2005). The inner dimension of social exclusion: Intelligent thought and self-regulation among rejected persons In: Williams, K. D., Forgas, J. P. and von Hippel, W. eds. The Social Outcast. NY: Taylor & Francis, pp. 1–15. Borchgrevink, A. (2013). A Norwegian Tragedy: Anders Behring Breivik and the Massacre on Utya. Cambridge: Polity. Civil Rights Summit. Confronting discrimination in the post-9/11 era: challenges and opportunities ten years later. Retrieved on 22nd March 2013 from www.justice.gov/crt/.../post911/post911summit_report_2012-04.pdf. Commission of Racial Equality. Citizenship and Belonging: What is Britishness?. The Decline of Britishness. London: CRE. Retrieved on 22nd March 2013 from http://ethnos.co.uk/decline_of_britishness.pdf. Eriksen, A. K. O. (2012). Exclusion and Xenophobia: Norwegian Society’s Influences on Anders Behring Breivik’s Counter-Jihadism. Master Theses. Paper 39, Retrieved on 31st January 2014 from http://repository.usfca.edu/cgi/viewcontent.cgi?article=1042&context=thes. Fiske, S. T. and Taylor, S. E. (2008). Social Cognition: From Brains to Culture. NY: McGraw-Hill. 4th ed. Githens-Mazer, J. and Lambert, R. (2010). Islamophobia and anti-Muslim hate crime: A London case study. Retrieved on 22nd March 2013 from http://centres.exeter.ac.uk/emrc/publications/Islamophobia_and_Anti-Muslim_Hate_Crime.pdf. Gould, E. D. and Klor, E. (2012). The long-run effect of 9/11: Terrorism, backlash, and the assimilation of Muslim immigrants in the West. Retrieved on 11th January 2014 from http://econ.tau.ac.il/papers/labor/ISAS_April_4_2012.pdf. Hogg, M. A. and Vaughan, G. M. (2008). Social Psychology. Essex: Pearson. 5th ed. Home Affairs Committee. Roots of violent radicalisation. London: The Stationary Office Limited. Retrieved on 22nd March 2013 from www.parliament.uk/homeaffairscom. Intelligence and Security Committee. Could 7/7 Have Been Prevented?. Retrieved on 22nd March 2013 from http://www.officialdocuments.gov.uk/document/cm67/6785/6785.asp. Jordan, M. (2006). Britain’s MI5 warns of rising terror threat. The Washington Post, Retrieved on 22nd March 2013 from http://www.washingtonpost.com/wp-dyn/content/article/2006/11/10/AR2006111000138.html. McHarg, E. (2012). Studies in the nature and consequences of computer-mediated ostracism. Egham: Royal Holloway, University of London. (Unpublished doctoral dissertation). Moreland, R. M., Levine, J. and Cini, M. (1993). Group socialization: The role of commitment In: Hogg, M. A. and Abrams, D. eds. Group motivation: Social Psychological Perspectives. Hemel Hempstead: Harvester Wheatsheaf, pp. 105–129. Pickett, C. L. and Gardner, W. L. (2005). The social monitoring system: Enhanced sensitivity to social cues as an adaptive response to social exclusion In: Williams, K., Forgas, J. and von Hippel, W. eds. The Social Outcast: Ostracism, Social exclusion, Rejection, and Bullying. New York: Psychology Press, pp. 213–226. Precht, T. (2007). Home grown terrorism and Islamist radicalisation in Europe. Retrieved on 11th January 2014 from http://www.justitsministeriet.dk/sites/default/files/media/Arbejdsomraader/Forskning/Forskningspuljen/2011/2007/Home_grown_terrorism_and_Islamist_radicalisation_in_Europe_-_an_assessment_of_influencing_factors__2_.pdf. Salovey, P., Rothman, A. J. and Rodin, J. (1998). Health behaviour In: Gilbert, D.T., Fiske, S.T. and Lindzey, G. eds. The Handbook of Social Psychology. New York: McGraw-Hill, 4th ed. 2pp. 633–683. Study of Terrorism and Responses to Terrorism. Violent extremism in the U.S.. Retrieved on 11th January 2014 from http://www.start.umd.edu/start/announcements/announcement.asp?id=277. Tennen, H. and Affleck, G. (1993). The puzzles of self-esteem: A clinical perspective In: Baumeister, R. F. ed. Self-esteem: The Puzzle of Low Self-regard. NY: Plenum Press, pp. 241–262. Thachuk, K. L., Bowman, M. E. and Richardson, C. (2008). Homegrown terrorism: The threat within. National Defense University Washington Dc Center For Technology And National Security Policy. Retrieved on 22nd March 2013 from http://www.ndu.edu/CTNSP/docUploaded/DTP%2048%20Home%20Grown%20Terrorism.pdf. Williams, K. D. and Zadro, L. (2005). Ostracism: The indiscriminate early detection system In: Williams, K. D., Forgas, J. P. and von Hippel, W. eds. The social outcast: Ostracism, social exclusion, rejection, and bullying. NY: Psychology Press, pp. 19–34. Zadro, L. (2011). Silent rage: When being excluded and ignored leads to acts of aggression, vengeance, and/or self-harm In: Forgas, J. P, Kruglanski, A. and Williams, K. D eds. Social Conflict and Aggression. NY: Psychology Press, pp. 201–216.